Original it is! Basically, Paresh Rawal and some other guy (forgot his name, could care less) are brothers (and naturally reeking with money) and Amrish Puri is ´Other Guy´s´ achha dost... Paresh and OG are also business rivals, Paresh is part-time villian, Amrish Puri has a ´soni bachhi´ named Pooja (Mads, of course) and a biwi, and OG has a son named Amar (who else could play the rich guy so well as Pretty Boy nasal-voice Saif? )...Paresh kills OG while bachhe are young, and Amrish has to raise Amar (after the traditional vachan speel while dying delivered by OG). Years later (bees saal baad), Pooja becomes a ´Soni Kudi´, and loves giggling, and shopping with girls half her age. Runs into pilot Vijay (Ape Akki), rather, his car, he gets revenge for damaging his car by kissing her, and voila! they are in love. (takes a total of about 7 minutes). Sing ´Tu Soni Kudi´ (ahhh...love that song! ), meet the mother who raised him, a Christian ´my child´ lady (Aroona Irani)...Mads is given the family heirloom (churiyan), all´s good in the love angle. I can´t tell you anymore ! If I do, it would ruin the non-existent suspense ! There were some positives and some negatives (now you all guess which outweighed which).... and some truly amazing phenomenons...for example, Saif was shown as being able to fight. Right, if Saif can fight, and Mads could probably beat up Saif, then Bollywood needs some less puny villians. Another, in a restaurant sequence, Madhuri changed her hairstyle at least 15 times, not exaggerating...and some where the hairstyles from the early 90´s, when this movie was signed ...methinks some of these scenes were taken from years ago, and some more recent ones....but ufff tauba! The hairstyles were hideous! (Not to mention the frumpy early 90´s clothes). Clothes, scenery, makeup, etc. Clothes were, overall, average...not great, not bad. Mads and her disgusting dancers in "Saajan Saajan Teri Dulhan" looked awful and ruined the otherwise pleasant song (let´s not comment on the high-pitched yelping at the end of each refrain)...some clothes were from the 80´s, some were a bit too uhhmm "young" from otherwise beautiful Mads (she´s long past the "cute" stage), some were tacky (e.g. Ape Akki´s uhhmm "masculinity" (read: overabundance of chest hair) very well emphasized in his disgusting net-like shirts), and some were plain horrifying ...what was the deal with Akki´s pink shirts, Saif baby´s maroon and red attire, and some gunda´s red pants?? eeeek! Makes ya kinda wonder´...if you guys figure it out, do let me know...it just emphasized Pretty Boy´s femininity...ahhh, Amrita Singh´s masculinity and Saif baby´s femininity sure balance one another out, huh. Scenery wasn´t particularly fascinating..though the what I took as mockery of Britain in "Main Aa Raha Hu Vaapas" (e.g. dancing with a gori budhi who took off and swung around her jacket while dancing with PB, and the fascination of focusing on the uhhmmm hefty man with an ice cream cone..) was humorous (ahhh....those Brits...*wink*). Again, they could have laid off of Saif baby´s makeup...didn´t they realize that they were supposed to emphasize Mad´s pretty eyes with kajal, not Saif´s? They did manage to avoid the ridiculous bright pinks and reds and white body paint Bollywood loves so much, and made Madhuri, in most scenes, look absolutely beautiful, in a very natural, classic Indian beauty way (a rarity in today´s industry). Some of her hairstyles were way too young for her...it emphasized her age rather than her youth. As for Apey Akki and PB´s hair....let´s not go there...halfway through the movie, Akki found a comb and decided to brush his thick (head) hair. Songs were depicted nicely...I, notorious for fastforwarding songs, did not, at all... they were pleasant and most seemed to fit well in with the movie (no "let´s get yelled at by my father and then find a raincloud to dance under´"songs), though some scenes could have been avoided (e.g. some suggestive shower scenes that takes away from the "cleanliness" of the movie). Ahhh...Tu Soni Kudi....my favorite song... came right in the beginning, and was cute...one of the pluses of the film. Dubbing...now this was more interesting than the movie itself. When you watch this, tune into the scene when Akki comes back from the ´dead´ and arrives at the gate of his old home, in search for his mother. The dialogue in front of the gate was so blatantly dubbed by someone else who made even Saif sound masculine.... it´s one of the best scenes of the movie (now I think you get the drift of how great the movie really was). Watch it, and you´ll understand. Acting...again, Saif is still learning....Akki´s getting there (give him about 10 more years), and Mads was fantastic, as usual (she made it there years ago). Madhuri, despite any role given, carries it off with ease and grace.... even despite the mismatch of age, she does justice to her role, and is the best actress in Bollywood today, comparatively (though I am not saying that wonderful actresses like Kajol and Juhi are far behind...but she´s got a longer track record to her name as well). She also is what I consider a classic Indian beauty.... her natural, distinctive Indian looks set her apart from many other heroines (I say heroines because many have yet to learn to act, and cannot justfully be called actresses yet), she proves that she does not need blatant blond/red highlights, tons of body paint and makeup, blue contacts, and scraps of clothes to look beautiful...and that the complete following of Western trends isn´t worth sacrificing traditional Indian beauty, grace, and respect for popularity...a mixture of both that remains respectable...it´s quality rather than quantity (or lackthereof, in the clothes department). There´s several blatant flaws in the film, if I were to list all, it would take longer than three hours to read, and in that time, you could watch the movie and figure them out yourself. Akki and Mads fall in love in total of 7 minutes (hey, with so much of a story to finish, we gotta make the lovey dovey thing QUICK), after Akki forcefully kisses her (sexual harassment or a new style of wooing? 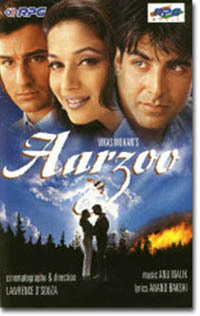 ), and the end stretches out, but hey, Bollywood´s gotta fill their three-hour quota. I could say that "Yes, this was a total bakwaas film", and in many aspects, it is. It´s also a typical overdone story...a lot of cliches. But so are most other Hindi films...try naming at least 15 of the 400+ Hindi films Bollywood put out last year that were completely original. Taking it lightheartedly, it wasn´t bad...but it definitely would not be worth watching in the theater.